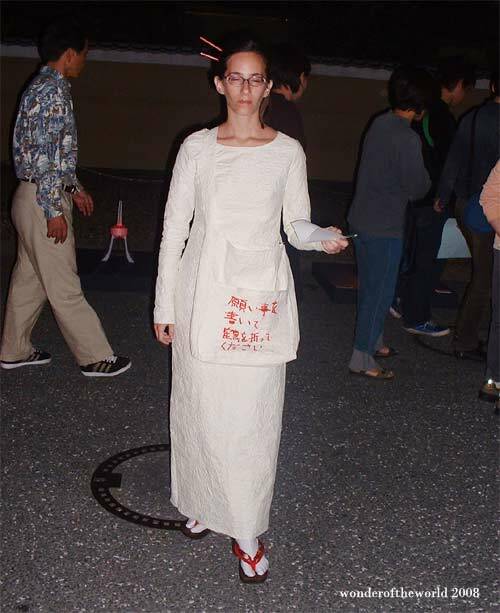 Nelly Agassi worked primarily on a dress, she also had a public street performance where she asked people to make a formal wish using an Origami paper crane. Her exhibition work at the museum was a handmade dress held by strands of washi securely tied with stones. The Origami paper cranes were burnt after the residency. 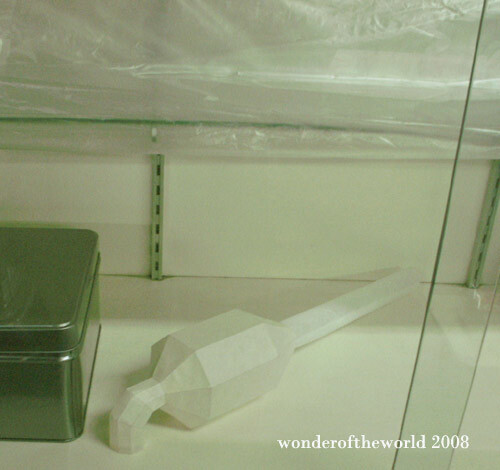 Richard Bolai (Feinin) make every effort to teach the simple methods of making a handmade book. 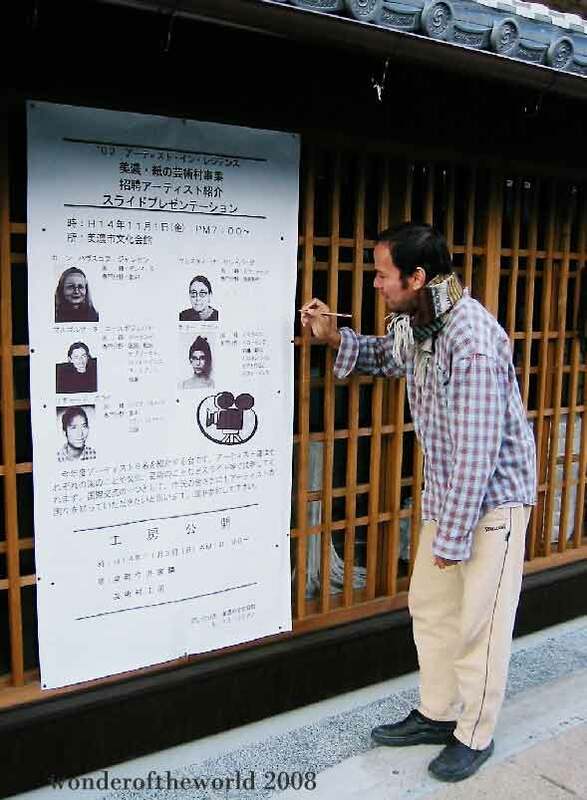 He also used the traditional methods of Japanese binding to produce a series of art books for members of the Mino committee, artists, and to the Mino paper museum. Yet the first impression of the work space was quite a shock. They also had a portable tolet in the yard which [we] never used. Christina Lindeberg work may have been best described as tactile in nature. The artist focused on intricate paper twists and washi threads which she hung from parts of the gallery in her final exhibition. She was steadfast and mature over her unquestionable treatment during her stay. She never displayed her concern. Malgorzata Niespodziewana was blessed with a host family, Takahashi where she had her own private space. She was also an artist whose personality help bond all the artists together. 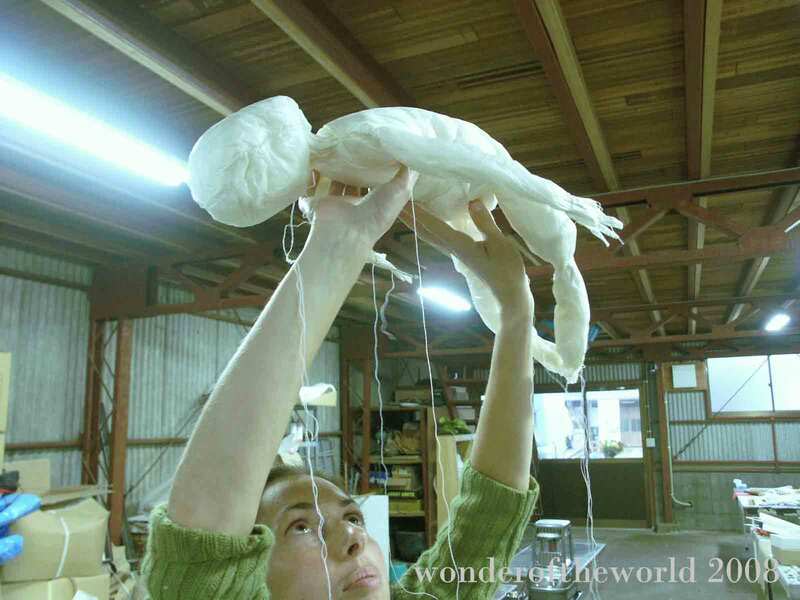 As part of her work, she produced these human forms out of washi, such as with the child she is holding up. The infant here is a premonition. She give birth to a first child a few years later and she has managed to reunite with, Karen Havskov Jensen, Nelly Agassi, Christina Lindeberg and the Shinoharas since then. Karen Havskov Jensen experiences on this residency had its ups and downs, and also was traumatic. 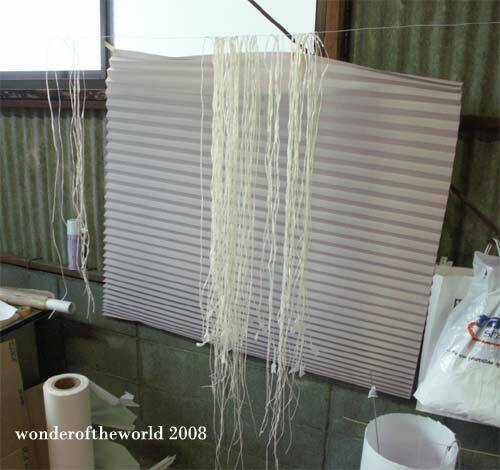 Yet she was capable to pull through and produced washi works using a process of patterns and mathematics, and thus her three-dimensional sculptures took on a life of it own. Recently, she sent me a postcard project she’s been working on which involved objects in a suitcase, a trademark in her work. The photograph shows she eating a supermarket brought Susi meal which we had most of the time located at the only corner shop in the town.